Puppies are cute, full of energy, and possibly the most playful animals on the planet! They are also rough and tend to contort their body’s in positions no one thought possible. Typically, when an owner brings a puppy to see us there is something extreme going on. We see limping, severe muscle spasm, significant structural dysfunction of the spine, and more. These are obvious reasons to bring any dog in. However, what about healthy dogs that show no signs of pain? 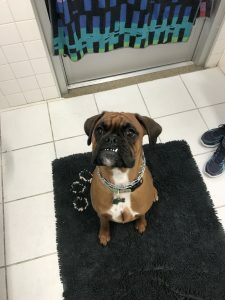 This blog will describe why it’s a good idea to get periodic check ups starting as a puppy to help physical development, even if there are no obvious symptoms. In fact, most dogs won’t show signs of pain unless the issue is extreme. From an evolutionary perspective, it benefits them to behave this way. Before dogs were domesticated, they spent their days hunting for food – and also being hunted. When an animal shows weakness, a predator higher in the food chain targets them. Therefore, dogs developed to not show any signs of weakness until it was extreme to avoid becoming prey. It would be great if our dogs could tell us when they were experiencing discomfort. Since they can’t, the only way you will know is when they start to show a limp, etc. and by then, it has been going on a while. Therefore, a periodic check up for a puppy every few months keeps them ahead of any issues. Injuries such as cruciate tears – The knee (stifle) in a dog is under a lot of pressure. If the foundation of their body, the spine, is off – it can lead to abnormal stress on other joints. This could lead to enhanced strain on joints and lead to an increased risk for cruciate tears, etc. As you can see, structural dysfunction of the spine is a small thing that could lead to much larger issues. The good news is that we don’t see many puppies for extreme issues in our practice! They tend to be pretty resilient, even for all the crazy things they do. However, many owners bring their pups in periodically (every few months) to make sure a little thing such as a minor tweak doesn’t develop to major issues down the road. Is animal chiropractic right for your little one? Visit our site to learn more about structural dysfunction of the spine and how it affects all animals by clicking here. http://advancedanimalchiropractic.com/wp-content/uploads/2018/10/Stella-Simmons-e1538413139906.jpg 4032 3024 Dr. Christina Cole http://advancedanimalchiropractic.com/wp-content/uploads/2019/02/logo-l2.png Dr. Christina Cole2018-10-01 17:00:452018-10-01 17:00:45Chiropractic care for puppies?